It's time to open Door 13 of The Cosmic Shed advent calendar. Simply press play above or subscribe and play on your favourite podcast delivery system. We've been discussing 'Oumuamua, the interstellar visitor a fair bit of late and we've brought someone rather key to that whole discovery for you today. Someone whose TEDtalk on the subject has received well over 3 millions views. Here's an artist's impression of 'Oumuamua to push the identity of today's guest further down the page to allow you to have it as a surprise when you listen to the episode. 'Oumuamua means first messenger from the distant past. Behind Door Number 13 is Dr Karen Meech. Karen is the person people call when they think they have found something from outside our solar system careering through it. An astronomer on Hawaii, Karen has been studying the skies for years, looking for something out of the ordinary to come along. In October 2017, they discovered just that. Something truly extraordinary. 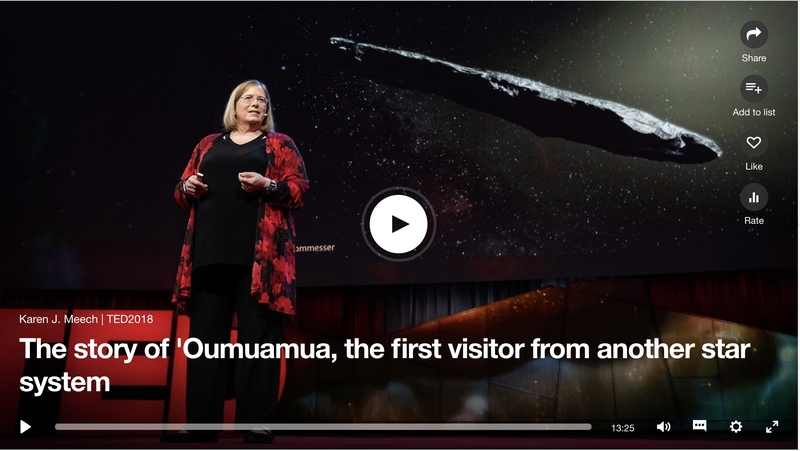 Andrew has been writing a feature article on Oumuamua for Physics World and watched Karen's TEDtalk (which you can see below) and just had to know more so called up Karen (who was at NASA's JPL working on a new mission proposal) to talk about this amazing discovery. Their conversation is behind the Door 13 of The Cosmic Shed Advent Calendar.